Can you drive your car with the check engine light on? ​​Not all dashboard engine warning lights on the vehicle are the same. 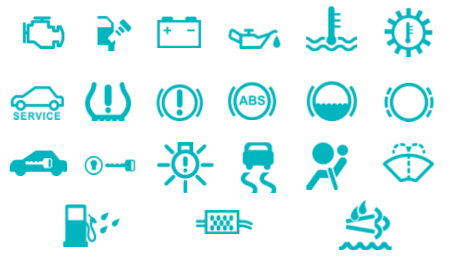 Always use the owner’s manual when trying to identify what it indicates if any light on your cars dashboard symbols turns on. what are the lights on the dashboard mean? what does the engine check light mean on my dashboard? can I drive a car with check engine light on? What does a car with a wavy line mean? ​Most drivers are familiar with many of the car light symbol meaning, but some are not. Most of the times the light indicates that there is a problem in the vehicle's system that needs your attention but doesn’t tell you exactly what the problem is or where is it. If one of your lights on your vehicle's dashboard is on, visit any auto parts store. Most of them offer free engine light code pull service for vehicles from 1996 and up. ​ The light may indicate a simple problem like a loose gas cap, which is an easy fix, but might also be indicating more serious problems that could damage your vehicle if not taken care of and turn the need for a tow truck to jump in for help. ​There are literally hundreds of reasons this light can come on. Many different affected parts of a vehicle can trigger the check engine light to turn on, the only way to know what exactly the problem might be, is to use the scanning tool. An overheating engine, a weak battery, a problem with your electrical system, all this can leave you stranded on the side of the road and in need of our vehicle towing services. There are many reasons for a check engine light to turn on: loosen or damaged gas cap, faulty oxygen sensor, a faulty mass air flow sensor, bad spark plug, missed scheduled engine maintenance, a due oil change or other electrical or engine performance issues. A defective oxygen sensor will not provide the information to the vehicles computer. Because this sensor monitors the exhausted for unburned oxygen, if it's not replaced in time, it will damage your catalytic system, which is costly to replace. A faulty mass airflow sensor will determine your car to stall, poorly idle and your gas mileage will go down. The airflow sensor directs the vehicles computer to add the correct amount of fuel based on the airflow coming through the engine. This can be triggered by a never replaced or it was improperly installed the air filter. Spark plugs need to be replaced every 30.000 miles if you have an older model vehicle or every 100.000 miles for newer vehicles. If the spark plug needs to be replaced, it might cause the check engine light turn on. The plug acts as a seal in the combustion chamber and provides the gap for the spark that causes combustion in the engine. ​If your check engine light is steady, the problem you might have is not an emergency, but you should still take your car to a technician to be checked. Dashboard lights flickering on and off? ​If your light is blinking, it means its an emergency. Your engine might be misfiring, allowing unburned fuel to end up in the exhausting system. This can cause a huge damage in your car and require expensive repairs. If your check engine light starts blinking please find the nearest auto repair service, or if this is not possible, because of the time of day or night it happens, please stop in a safe place and start looking on your phone for towing providers. “24 hour towing companies near my location”, “Georgia roadside assistance”, “24 hour tow service”, “24 hour towing near my location” might be the most significant search terms you can use to find help. ​There is a possibility that the car dashboard symbols turn on while you are driving. If your car doesn’t drive differently than before, no strange sound appears, you should not panic. It can mean anything from failing oxygen sensor, bad MAF sensor or problems with the catalytic converter. If lights appear after fueling, it indicates there is a loose gas cap. You need to stop the vehicle and check your gas cap. If you didn’t leave it open by mistake, take it off and reinstall it. Continue driving the car and see if the lights will go out, if it doesn’t it may indicate a bad or failing gas cap. What are the symptoms of a bad or failing gas cap? ​ Removing the fuel cap when fueling will wear the cap off in time and must be replaced. Driving with a bad gas cap will result in dust or debris entering the gas tank, will affect the vehicles evaporative emission system. There are some symptoms that will alert you to the potential issue. The cap doesn’t click. The gas caps need to click once they are tightened sufficiently. If the cap doesn’t click or it gets loosen again, it’s time to replace it. Persistent fuel smell around the vehicle. When the gas cap is defective a strong fuel smell can be present around the vehicle. Check engine light comes on. Because the gas cap is a part of the vehicles evaporative emission system, the check engine symbol light will turn on, because the system will detect there is a leak. In almost every case, you have either a bad battery or a failing alternator. Your oil pressure is low, and the level needs to be checked. If oil level is not normal, the engine requires service. Do not start, run or drive until required service has been performed. ​Your engine is overheating; stop driving and turn your vehicle off. Check your coolant level, make sure your fan(s) are working and the radiator cap is holding pressure. Do not drive the vehicle until you have a fix in place. ​Your transmission fluid is too hot, and there is a risk of transmission failure. Check transmission fluid and coolant levels. Do not drive the vehicle until the cause of the overheating has been addressed. ​You have one or more tires with low pressure, or a sensor that needs replaced. Check your tire pressure to determine whether air needs to be added or the vehicle needs a new TPMS sensor. ​You likely have either low brake fluid or a failure in brake components. Check your brake fluid level; also, make sure your parking brake is fully released. Do not drive until issues have been addressed. ​Your Antilock Braking System is malfunctioning and requires service. ​Your brake fluid is low; check the fluid level and add the appropriate amount, or take your vehicle in for service. You could have a leak or worn pads. ​Your brake pads are worn and need to be replaced before your rotors are affected. ​The ignition switch is locked and requires the proper transponder-equipped key to start. If lit steadily while the vehicle is on, the security system may be malfunctioning. ​You have a headlight that is burned out or malfunctioning. ​When lit or flashing for an extended period, there is a fault in your vehicle's stability control. Drive with caution until you can have the system serviced. ​There is an issue with one of your airbags that requires service. ​Fill your windshield washer fluid reservoir as soon as possible. ​This light indicates that the diesel particulate filter requires service so that engine power is not lost. ​This light indicates that the diesel exhaust fluid (DEF) is low and needs to be topped off. ​This light indicates that the separator (that removes water from the fuel) requires service. ​ Your vehicle will give you an error code that can be easily read with a code detector tool. These readers can identify the problem and direct the technician who is running the code reading process to what part of the vehicle you need to replace or repair. The codes will indicate only in which system or circuit to test so you can isolate the problem but it will not tell you what the actual problem is. Each code has a matching number with a test procedure. How does this scan tool know what is wrong with your car? It pulls all the information stored in your car's computer like codes and mileage. The data given its in an easy to read report.